Stuart Lightbody was born in London in 1984, as a baby he picked up a pack of cards and has never put them down. As a teenager he was lucky enough to enrol in the College of Magic where he developed a deep passion for this secretive art, and won many awards and competitions, including the Close Up Trophy and annual Close Up contest. His tireless training as a Sleight of Hand Artist has won him local recognition, as an SA Magic Championships Grand Prix Trophy winner, and international exposure, having represented South Africa at the World Magic Championships in Sweden and the World Magic Seminar in Las Vegas. Using nothing but a few simple everyday objects, like some coins or a pack of cards, Stuart can enter an audience, creating a sense of wonder, surprise and astonishment. 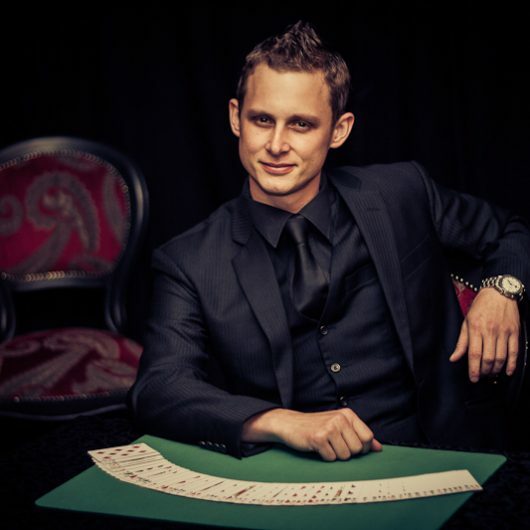 By combining cutting edge sleight of hand, misdirection and psychological techniques with an intimate, personalised approach, Stuart Lightbody has formed a unique fusion of skill, beauty and entertainment that guaranties a memorable experience. Stuart’s sleight of hand magic is perfect for product launches, cocktail parties, fundraisers; end of year functions, dinner parties, and wedding receptions… the list goes on. He has entertained for top local and international companies, like Pick ‘n Pay, Old Mutual, Glaxo Smith Kline, BMW, Coca Cola and many more.